It’s April, and the daffodils, day lilies, and other early flowers are pushing their way up out of my garden. If only it was as warm as it looked out there! Despite the calendar, winter hasn’t quite given up and gone away yet. To cheer myself up, I made this coloring page yesterday, and I’d like to share it with you. Click on the image to grab this free coloring page as a printable .jpg or .pdf! 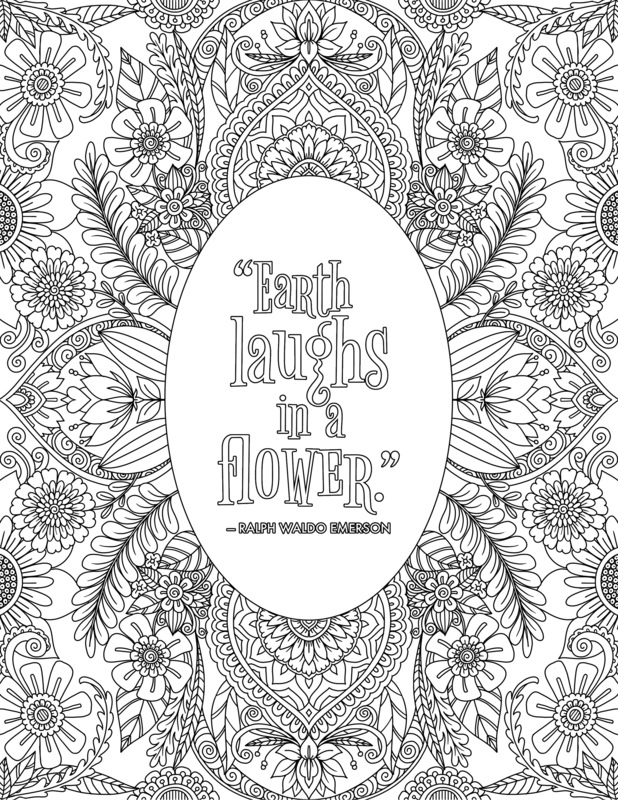 This coloring page features a lovely quote by Ralph Waldo Emerson, which reads, “Earth laughs in a flower.” I surrounded it by whimsical floral designs. If you’d like to color it, it’s available on my freebies page. I’m also putting the finishing touches on a new mandala coloring book which will be available on Amazon this week. Stay tuned for the announcement!